By Rick Kleyn, SPESFEED (Pty) Ltd.
Modern layer breeds are constantly changing through genetic selection and improvement. The principle aim of the primary breeding companies is to ensure that the birds sold to their clients are more efficient. From table 1, it can easily be seen just how successful they have been in this endeavour. These improvements have been achieved through a number of mechanisms, which include an increased egg output potential, a reduced age at sexual maturity and perhaps most importantly an improvement in feed conversion efficiency. *The manual only shows 17-week weights. It is well accepted that the modern genetic strains are more sensitive to poor nutrition and management than their predecessors and that this sensitivity exacerbated by the stress of modern pullet and layer housing conditions (Elliot, 2002). In this article, I would like to examine some of the underlying theory as well as some of the ideas being expressed by other authors on the topic of feeding the modern layer pullet. We should remember that layer pullets need to be reared to attain an ideal weight for age at some as yet undetermined ideal body composition, if they are to produce normally during lay. I will evaluate how nutritionists and farmers need to react to the challenge of feeding superior modern genotypes of laying hen in order to achieve these goals. Organ development must be achieved by 5 to 6 weeks of age. The bird normally achieves frame size by 12 to 14 weeks of age. It is known thatmost (90%) of the frame size is developed by this stage and that the „size‟ of the pullet is then fixed. It would appear that it is almost impossible to modify frame size without modifying body weight as well. The bird must reach sexual maturity at the correct weight and body composition. Although it is now well established that body weight is important for adequate early production, there is still insufficient evidence regarding optimum body structure and composition. It seems likely that birds having some energy reserve (fat) as they approach peak egg production are less prone to subsequent problems. Obese birds also tend to have prolapse problems so this is something that must be avoided as well. Flock uniformity is important and this can only be achieved by managing the birds in a good, uniform environment. The birds must be in a positive energy balance at peak production. The establishment of an energy reserve occurs during the rearing phase and has much to do with the birds body composition at point of lay.Nutrient Requirement, Feed Intake and Feed SpecificationsThe determination of an animal‟s nutrient requirements and the translation of these requirements into a feed specification are the cornerstone of modern poultry nutrition. Elliot (2002) contends that National Research Council (NRC, 1994) tables are of little practical use for commercial pullet and layer producers. This is because much of the data used to prepare the NRC recommendations was taken from older studies, which were conducted with late maturing genetic strains that performed at a far lower level than modern egg layer strains. This is only partially true, as the nutrient requirement, defined as the underlying amount of protein or energy required by gram of body weight, gain or production, has remained unchanged. However, the manner in which the nutrient requirements are expressed in the NRC (1994) tables makes it impossible to apply across different production systems.This was very clearly illustrated by the classic work of Morris and Njuro (1990). Diets were fed containing different levels of protein to both broiler and layer cockerels. 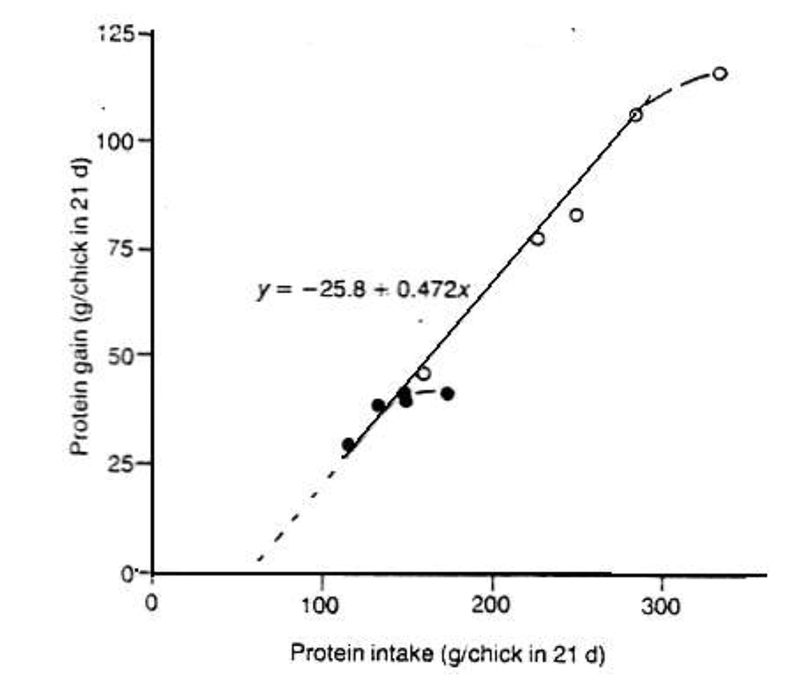 They found that the maximum gain in weight and protein content in the cockerels was achieved on diets with considerably lower protein contents than was needed to maximise the gain in the broilers (Fig 1). In spite of this, the efficiency of protein utilisation was the same for both genotypes. They found that 0.47 gram of protein was gained by the birds per gram of protein consumed. This relationship was linear until they had reached their genetic potential for protein gain. Aspects of genetic improvement are often forgotten. In order to improve feed conversion efficiency, breeding companies by default must select for birds that are inherently smaller. They have also been selecting birds that have what is termed a low residual feed intake (RFI). In essence this the feed intake that they cannot account for in terms of body weight, egg output or any other measurable parameter. The heritability of RFI is high at between 0.21 and 0.28 and selection for RFI is thus a valuable tool for reducing feed conversion. Gabarrou et al., (1998), reported on an experiment where two strains of laying hens that had been selected for 17 generations for either high RFI (R+) or low RFI (R-). They found that R+ birds consumed 48% more food than R- birds. Although the birds spent the same amount of time eating, R+ birds ate more frequent but smaller meals. R- birds are less active in terms of their feeding behaviour. They were also able to show that the nutrient utilisation of the two strains was similar, but that the R+ birds were better able to shed any surplus energy consumed, in the form of additional heat loss into the environment. By selecting birds that have a low RFI, inadvertent selection birds that are less active in their feeding behaviour will also be made. In short, the modern layer has become a “shy eater”, for want of a better term. Although that the underlying nutrient requirements of the modern pullet are unlikely to have changed, nutritionists and farmers are now being asked to feed a bird to meet a target body mass and carcass condition at an earlier and earlier age. It must be borne in mind that the birds may be becoming inherently smaller and possibly shy eaters. The changes in the rate of gain, coupled with possible changes in feed intake patterns, means that the way in which nutrient requirements are translated into feed specifications have also changed. The question then is what should we be doing in practice. Leeson and Summers, (1998) showed that if adequate protein intake is achieved, additional dietary protein does little to stimulate growth, if indeed it does not have a negative effect (Table 2). In essence, this work demonstrates that the protein requirement of pullets is comparatively low. These data can be supported by a simple calculation. If one were to calculated the lysine requirement for a 7 day old broiler chick weighing 185 g, gaining 30 g/day, and consuming 38 g of feed, the birds will be provided with 16.55 mg of lysine per gram of gain (Cobb, 2000). On the other hand, from the same calculation carried out for a 7 day old layer pullet, weighing 70 g, gaining 6.5 g/day and consuming 30 g of feed, it can be calculated that the bird is consuming 31.42 mg of lysine per gram of gain (Hy-Line 2002). It can clearly been seen that we are providing our layer pullets with nearly double the lysine per gram of gain than we are broilers, which from a nutritional perspective makes little sense. It also confirms the findings of Leeson and Summers that we are probably over feeding all of our pullets in terms of protein. Against this background, Leeson and Summers (1998) suggest that energy intake of the pullet is the limiting factor to growth rate, since regardless of diet specification, pullets seem to consume similar quantities of energy (where feed intake in not limiting). The response of growing pullets to energy is clearly shown in Table 3. Elliot (2002) has proposed and alternative dietary specifications for pullet feeding. In table 4 it can be seen just how different these are from the NRC (1994) and the breeding company these are. Bearing in mind that the quality of protein fed to a bird is determined by the level of the first limiting amino acid. Although Elliot proposes a far higher lysine level than the NRC, the threonine and tryptophan levels used are such that there is not likely to be any major difference in protein quality between the two recommendations. The Hy-line recommendation represents a significant improvement in protein quality. The question, which begs to be answered, is what should we do as both nutritionists and farmers?. It is probably fair to assume that we are supplying levels of protein and amino acid in our diets that easily meet or exceed the birds‟ requirements. For this reason, we need to focus on the energy consumed by the birds. The recommended energy level for a Starter diet made by Elliot is 12.36 MJ/kg, which is 3.3% higher than the breeder company recommendation at 11.97 MJ/kg. It is estimated that the higher energy diet would cost about R45/ton more than the lower energy diet. If feed intake were reduced in any way, the diet with the higher energy level would be expected to result in better pullet growth. On the other hand, if feed intake were to improve by 3.3% (i.e. from 46 g to 47.5 g) then the birds on the lower energy diet would consume the same amount of energy. In situations where management (cage design, feed form and temperature) limits feed intake and hence energy intake and growth, increasing the energy level of the diet is a strategy that may well work, for the simple reason that it will enable the birds to consume more energy. However, under good management this is unlikely to work, as the birds will simply eat less as the energy level of the diet is increased. Under warm conditions high energy diets lead to a reduction in protein intake below a certain critical level and result in underweight but over fat pullets (Table 5). Besides contributing to optimal body composition, moderate grower diet energy levels allow for a smooth energy transition from the grower to peak diet and the high fiber levels develop the gut capacity that enables the birds to consume adequate feed at the onset of production. This is a critical point because many performance problems can be traced to poor consumption at the onset of production. This is especially important during warm weather when feed consumption is already going to be lower due to the elevated ambient temperature (Elliot, 2002). Everything discussed thus far points to the fact that simply increasing the protein and energy levels of pullet diets is going to achieve very little for the average producer. What is needed is to increase the nutrient intake (energy in particular) through ensuring that the birds consume adequate feed. The nutritionist and feed supplier do play a role here. However, it is likely that the producer can have a far bigger impact on this aspect than he realises. From a feed company perspective, they can ensure that the grist of the feed is uniform. This prevents selective feeding and improves uniformity. If the dustiness of the feed can be reduced in some way, either by adding oil or molasses, feed intake can be improved. The aspect that will make the biggest difference though is that of feed form. It has been shown that poultry take three times as long to consume their feed when it is in a mash form as opposed to a pelleted form. By simply feeding pellets, or crumbles in the case of younger birds, feed intakes can be increased dramatically. The producer can play a role in increasing feed intake through a number of mechanisms, most of which would fall under the heading of good management. These would include aspects such as ensuring that birds have feed and water at all times, that the environment within the house is uniform and that the birds are healthy. The only major change that can be brought about on farm to ensure an increase in feed intake is to reduce the stocking density of the cages.